Norwalk Redevelopment Agency Executive Director Tim Sheehan explains the proposed changes to the Land Disposition Agreement for the 95/7 site Monday in City Hall. NORWALK, Conn. – It was a good night Monday for the developers who want to build a mall in SoNo – most of the people speaking to the government officials who can advance the project said positive things. About 40 people sat in the audience in the City Hall community room for the Joint Committee meeting, held just to get input from the public before the respective bodies vote Thursday on the proposed changes to the Land Disposition Agreement (LDA) for the 95/7 site. Three of the speakers were directly connected to the project. “Naysayers” chiefly expressed concerns about traffic (see separate story), although Diane Lauricella also said Norwalk should be getting more from the state as a mall would generate less in tax revenue than the previously approved development would have brought, and Deb Goldstein said she was worried about businesses in SoNo. Spinnaker Real Estate Partners CEO Clay Fowler said that people shouldn’t get ahead of themselves. Planning Committee Chairman Doug Hempstead (R-At Large) said after the meeting it was an accurate statement, as far as the process goes. “They need to know is there stomach for the city of Norwalk to expand the retail on this site, and that is what this does. They have a lot of work to do between this and getting to the end game,” Hempstead said, referring to the proposed LDA change. Among the Norwalkers giving glowing reviews to the possibility of a mall in SoNo was Isabelle Hargrove, referring to the announcement that Nordstrom’s has committed to be an anchor. Former Common Councilwoman Patsy Brescia asked people to think back 50 years when there was a “teepee of burning garbage” at the city dump next to the 95/7 site, the depressed landscape and the turmoil from the construction of Route 7. Many of the people speaking as naysayers on the mall were also against buying the railroad station, a municipal golf course, the Maritime Aquarium, the Norwalk Museum, and a new campus for Norwalk Community College and a connectivity plan. One of her favorite places to shop is in Natick, Mass., she said, pointing out that it’s a GGP mall. Joanne Horvath echoed some of those thoughts. “Redevelopment for this site has been going on since the 1980s and finally a developer has come up with what I believe is the best possible use for this property,” she said, adding that the site is highly visible from I-95 and easily accessible from Route 7. A Bloomingdales as the second anchor would put Norwalk on the map as a shopping destination, she said. But she recommended that GGP choose housing over a hotel for the property, as it would be perfect for Transit Oriented Development. Some people didn’t expect to speak. Called to the lectern, Librarian Christine Bradley said she lives behind the mall site and walks to Belden Avenue every day to go to work. She’ll be walking past Nordstrom’s if this comes to fruition, she said. “I worry about my financial future, but I think I will have some momentary happiness,” Bradley said. Sherelle Harris also got drafted, joking that it was a “conspiracy” for the library to say it supports the mall. “Maybe I am the leader of the naysayers but part of this is to be really doing the due diligence and not just continue to look at the pros column but to look at the cons,” Goldstein said. Lauricella asked the committee to postpone the vote and do their homework. It’s nice that the committee hired a mall expert as a consultant, but an opinion should be sought from an expert on mixed use next to highway, such as the Jonathan Rose Companies, she said. She asked, if there is no market for Class A office space, why was Class B office space not considered? Hempstead said after the meeting that rents for Class B office space do not support the cost of construction. Offering short comments for the mall were Eric Rains, Fat Cat Pie Company co-owner Michael Pelletier, Christine Jensen and Rosemary Kelly. Paxton Kinol of Belpointe Capital said the Waypointe developers are in full support of a mall, and were “blown away” by the early conceptual renderings. “If Apple designed a mall it would look something like this, where it’s modern and more open,” he said. Greater Norwalk Chamber of Commerce President Ed Musante called it a “strong showing” for the mall. RDA Chairman Felix Serrano said nothing has been eliminated from the LDA, just updated to reflect current studies. The process is far from over, Hempstead said. If the Council and the RDA approve the outline that has been proposed, and the full Council votes for it, three sets of attorneys will open up the LDA and get to work. Nothing is binding until the LDA is signed, and the site plan for the property will need to have an LDA attached. The RDA and the Planning Committee will hold a joint meeting at 7 p.m. Thursday in the Council chambers. Further public comment is invited. Correction 2 p.m., Deb Goldstein’s quote was missing two words. 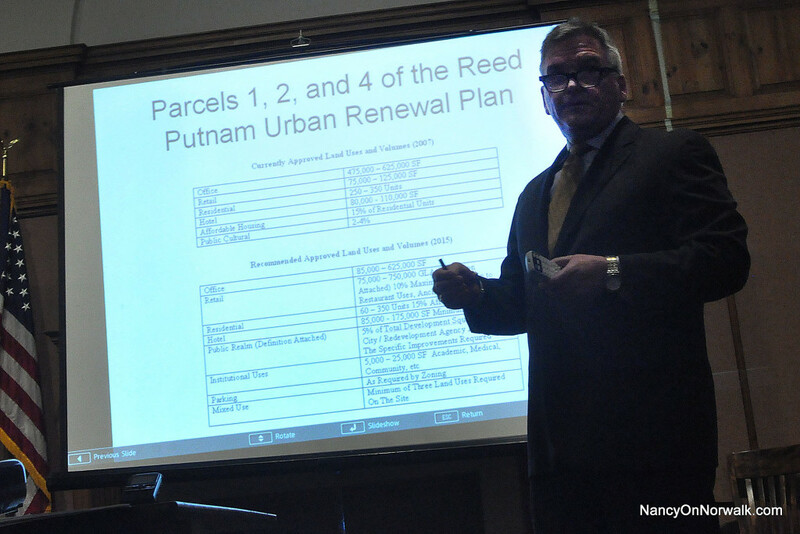 Norwalk Redevelopment Agency Executive Director Tim Sheehan takes the lectern Monday in the City Hall community room at a joint meeting of the RDA and the Common Council Planning Committee. Why can’t our elected officials secure some tax breaks or contributions from the state, which stands to gain much more financially from building the mall than Norwalk? How about a $50m, $75m, or $100m from the state for our infrstructure and schools? If they can’t secure that, perhaps we should wait until they do? Agreed – let’s start talking about the state funding that will support and also what changes there will be to the tax breaks to the developer. Also, it is too early to be for or against, but this statement was concerning, “What I did hear was kind of the new naysaying, and the way you can actually kill a project without being against it, is to say slow down, take your time, let’s ponder this for a long time because that is the way to kill a project,” coupled with, “So let’s get built while we are still in this cycle, we don’t miss another one like we did with our project, our earlier proposed 95/7 project.” I thought the naysayers on the last project did a good thing by all reports from the current group (i.e., if we went with office space it would be empty now). Finally, the “what if” exercise is precisely what should be talked about. We already know that if everything happens exactly how it is presented (which is an extremely optimistic view), it will be a great thing for Norwalk. Unfortunately, I am not currently in the area during the week to make the meetings – are meetings ever held on the weekend (not requesting, just asking)? Maritime Yards Condo Owner- During the past two months there were almost weekly Saturday ad-hoc committee meetings that were a great opportunity for public input and discussion on these land uses and volumes. Council meetings are broadcasted locally and online if you can’t make it during the week. Please do not let what has happened to MANY A CITY happen to Norwalk . Nordstrom has made MANY CITYS build their stores thru tax incentives PIFS and sales tax rebates for 10 or more years . Then shut down and or downgrade their level of merchandise . Many Malls and city’s have giant empty Malls or Stores after the period of incentives wears out . @Dan. Is this any different than any other corporate development? Look at Stamford and UBS. As soon as the tax incentives expired they threatened to move back to NYC. The best we could hope for is for Norwalk to get a cut of the sales tax revenue generated by all of the retail we support for the surrounding areas. This could ultimately make retail worth the aggravation. Just what we need; a really large, expensive eyesore. Dan, Residents are not BEWARING – they just can’t wait for the highest expression of culture in American culture: shopping. So, between Big Box stores, Chain Stores, High End Stores, etc., etc., Norwalk will be known as the shopping mecca of Fairfield County. And, you can bet on it, people will drive in and people will drive out. Who wants to spend time in a place with such shallow expression of unique culture?